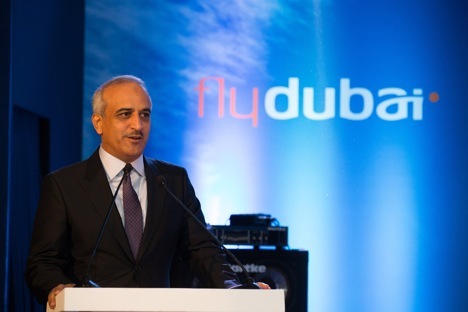 Ghaith Al Ghaith, Chief Executive of flydubai, which recently launched new destinations in Russia and India talks with RIR about the potential of these two regions, Russia’s diverse culture, and finding inspiration in Mumbai. What are the total number of flights to Russia in the company`s portfolio? How will that increase with the start of flights to Moscow? Flydubai currently flies to Kazan, Krasnodar, Mineralnye Vody, Rostov-on-Don, Samara, Ufa, Volgograd and Yekaterinburg in Russia and from September we will fly to Moscow and will have 38 flights a week. Do you expect to increase the number of Russian destinations to meet an increase in demand of Russian passengers over the next few years? Of course, we will add more capacity. As far as we are concerned, we believe Russia is a new frontier of opportunity specifically for trade and tourism between Russia and India. How many passengers do you expect on the Indian destinations? Earlier this month we doubled our network in India with the addition of flights to Delhi, Kochi and Thiruvananthapuram. So far we’ve seen strong demand for these flights. What would be the share of Indian flights in the company’s portfolio? Currently operating to six points in India, India represents the third largest country that flydubai operates to by number of points. You mentioned one more trend – to connect Russian and Indian regions via Dubai. What do you mean exactly? We probably have the best network of cities connected from India via Dubai to Russia because we currently serve eight destinations. Moscow will be the ninth destination and we are planning to add one more, offering 10 destinations in Russia. Together with the points we serve from India, we can offer the best connection to these cities via Dubai. In establishing this network of routes between Russia and India, flydubai will significantly increase both tourism and trade links between the two countries and so we believe that having that characteristic in flydubai, will help people to travel between India and these cities in Russia. You have been to both India and Russia. What are your biggest impressions about them? In Russia, of course it is the diversity of the culture. You go into different cities, there is a different culture. The people have a very strong character. Russia, of course, like India is a big country. It is very diverse. Every city you visit is different if you just consider three cities I visited, - Moscow, Yekaterinburg and Kazan. And of course, the winter is very cold. With regards to India, for you as a Russian, India is a foreign country. For me, it is not because in Dubai we have very close ties with India. Sometimes India feels like Dubai and Dubai feels like India, because we are so close. We eat the same food, we sometimes use the same language. I am sure when Indians come to Dubai, they feel very much at home. What are the most important regions for your company? For us the region we call the GCC, the Gulf Cooperation Council, is very important because it is very big. Today Russia and the former Soviet Union is number two. India is number one in potential and this depends on our opening enough routes. Which city is your favourite in India? Bombay. Bombay for us, in the United Arab Emirates and Dubai, is almost the same because it is on the sea, our grandfathers and fathers used to come by ship to India. So what did they know in India, which country did they know, which city did they know? That city is Bombay. Many people dream to be CEO. How do you become a CEO? L-U-C-K-Y. Lucky. You have to work very hard. You need to gain experience. You also need opportunity and when you see that opportunity you have to seize it. You also need to listen, to listen to yourself to understand what you want to achieve, to people around you to learn from their experience. Then decide yourself what is the best and move forward, never look back.